The first image of one of Pentax's two rumoured mirrorless cameras has surfaced on the internet. A leaked photo appears to show a Pentax mirrorless camera – the Pentax NC-1 – and two lenses, according to a new report. 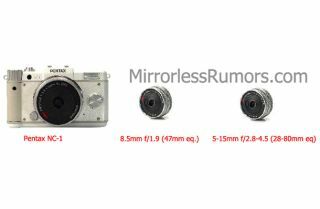 Sources have given the Mirrorless Rumors website images of the Pentax NC-1 mirrorless system camera, along with pictures of 8.5mm f/1.9 and 5-15mm f/2.8-4.5 lenses. Mirrorless Rumors claims the Pentax NC-1 specs will boast a 14-megapixel 5.6x crop sensor and HD video recording. The Pentax NC-1 will be one of two mirrorless systems said to be developed by Pentax – the other Pentax camera boasting a larger APS-C sensor and compatible with K-mount lenses. It is understood that the Pentax NC mirrorless system will be announced in May or June, while the other Pentax camera release date remains unclear. Earlier this month our colleagues at PhotoRadar reported that a source close to the company said Pentax had noted the success of mirrorless interchangeable lens cameras and was considering its own entry into the market. However, the source denied rumours that a Pentax mirrorless camera would be announced this spring.